IMPORTANT: This is a two-part training. Part 1 will take place on Tuesday, April 16th, 2019 at 5:00 P.M. Part 2 will take place on Wednesday, April 17th, 2019 at 5:00 P.M. Both parts must be taken in order to receive a certification of completion. 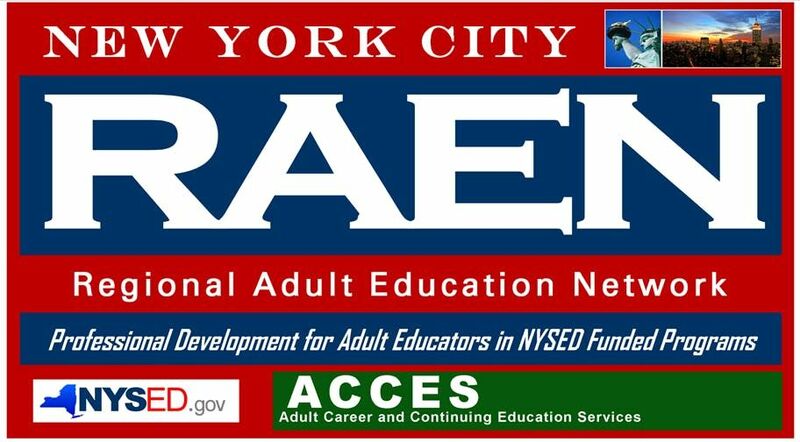 • All NYC RAEN workshops are for teachers/staff of NYSED-funded adult education programs. • This is a five (5) hour training. •NYC RAEN reserves the right to cancel or reschedule workshops with fewer than 10 participants. • Please be sure to arrive on time. No one will be allowed in the session after 15 minutes has passed. • If you cannot attend the workshop, please cancel your registration on Eventbrite. • If your program utilizes a “Time Card,” please bring a “Time Card” with you to the session. The New York City RAEN does not provide Time Cards. Please note: This event may be recorded and photographed for non-profit purposes including use in print, on the internet, and all other forms of media. All audience members (or parents/ guardians of minors attending the event) agree to the possibility of appearing on these recordings by virtue of attending the event or participating in the event.